This was a pretty cruddy day. Last night, the Detroit Tigers lost the ALCS to the Boston Red Sox, those grungy, prospector-looking bums from Beantown. It was a heartbreaker too – another late grand slam, base-running bloopers by Prince Fielder, more bullpen implosions. Then, just for good measure, the Lions choked away a game against the Cincinnati Bengals, Brutal. It’s only fitting that I sampled a brutal bourbon as well. This week, I tried another selection recommended for me by my favorite bourbon store here in Michigan, but the results left something to be desired. The Early Times 354 is a re-entry into the United States market. 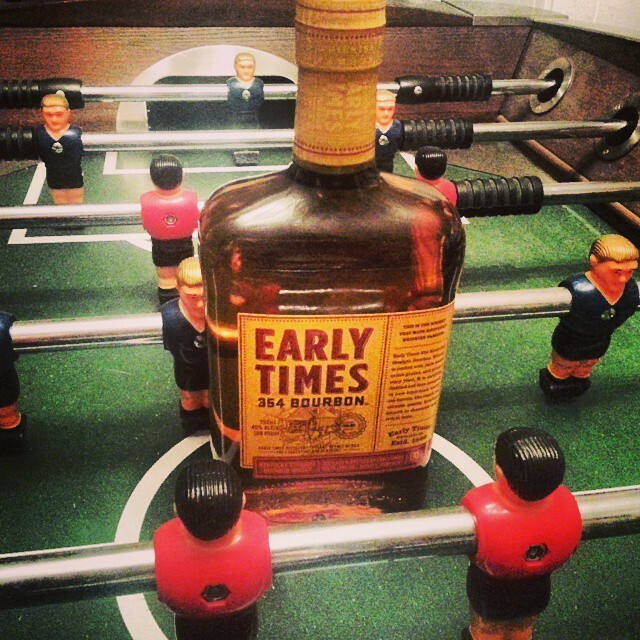 Early Times was apparently the most popular bourbon in the US in the 1950s, and was (and is) wildly popular in Japan. In sampling it, I couldn’t help but feel it was a throwback to the rougher and tougher standards people had before the more recent small batch, single barrel preference was made. All of that is a nice way of saying that, as a sipper, Early Times burned. It’s nose was harsh and primarily alcohol – I had to hold it for some time and at a further than normal distance to get a feeling for the notes of corn, cereals and a hint of spices. The taste I had a much more difficult time discerning. The alcohol was so strong, despite it’s being under hundred proof, that there wasn’t a lot of room for flavor. The finish was something out of an old western, where the hero takes a slug of the whiskey in the tavern and grunts. A slow, long burn. The rest of this bottle will be mixed with Coke for parties, where it will harm no one.